Welcome back to the Digital Dojo. This month we focus on the full-motion action video game Supreme Warrior. 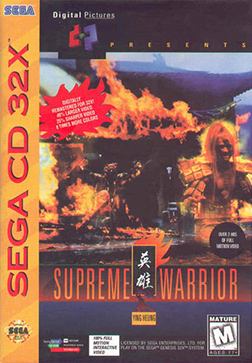 Released in 1994 on multiple platforms (Sega CD, Sega CD 32X, 3DO, Windows, Macintosh) by developer/publisher, Digital Pictures, Supreme Warrior was a fighting game played from the first person point of view. You play as a warrior in China hundreds of years ago who must protect part of a magical mask from the evil Fang Tu, who has the other half of the mask. If you fail at your task, Fang Tu will unite the pieces of the mask and be granted untold power. To succeed, you battle through minions to get to Fang Tu in an interactive full-motion video adventure. Supreme Warrior is pretty straight forward, and since it is done in live action there is not a whole lot to talk about in terms of proper martial arts, at least when you’re looking at the enemies. It is obvious when playing the game the actors playing opposing forces have had training. Even though your hands block much of the screen when playing the game, enemy motion clearly points to some type of Kung-Fu or Wu-Shu with all of their circular movements and more stylized fighting stances. The point of interest for our lesson is what style, if any, is used by the fighter we have taken control of. Since the game takes place in China you would think we too would be using one of the above mentioned styles since that is where they are most prevalent. However, this does not appear to be the case. From the player point of view, we can see the guard stance is much different from that of our attackers. Our hands remain out in front of us, in what some more modern styles would call a red alert stance. Think of this as a guard stance with open hands. It is supposed to look non-threatening and show a visual boundary to attackers, yet still give you a position to defend yourself from. As far as I know, this stance is not in variations of Kung-Fu or Wu-Shu. As for our striking ability, we seem to only use a few things; palm strikes, looping punches, front kicks, and round kicks. So, our fighter is either using a seriously watered down version of an Eastern art, or perhaps starting his own. While this most certainly wasn’t the idea the game would have had in mind, I find it interesting our striking arsenal resembles a possible early form of Kenpo. Again, this would be a very watered down version of the style, but who knows, maybe we are really playing as an early ancestor of Ed Parker (Kenpo founder). The last thing to look at for this game is the way in which our fighter throws his techniques. This is certainly the worst part of the game. While we move around when we get hit, the screen almost stays still any time we throw a punch or kick. The point of view should move around more than it does, as your body weight and position always shift when striking. The static point of view makes it look as though we have taken control of the Zohan. Every time my foot comes flying out of nowhere to hit an enemy I keep waiting for him to ask, “was that your foot?”. John Roberts has been training in martial arts for 12 years, and is currently a 3rd degree black belt in American Karate. Through the years he has trained in Tae Kwan Do, CDT, Brazilian Ju-Jitsu, Krav Maga, and KFM. Most recently he has also had the chance to do training with Ricardo Liborio and his American Top Team. Along with his years in the martial arts, John also has a bachelor's degree with a major in fine arts and a minor in philosophy. He enjoys first-person shooters in his free time. This month's Digital Dojo explores martial arts knowledge in the Indie game world with Battle High. Welcome back to the Digital Dojo, and this month's look into the weapon combat world of Samurai Shodown.